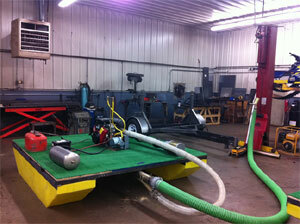 Please contact us with questions, for pricing, or for more information on our equipment for sale. Three versions of the Aqua Cleaner Suction Harvester are designed for individuals or groups of waterfront homeowners who share common aquatic vegetation problems. Suction Harvesting is the most effective way of removing aquatic vegetation because diver uproots the targeted plants and their rooting system plus the years past decomposing plants a feeds them into a vacuum hose that conveys them to the surface. There, they are separated from th water and captured in one of several options depending on which machine you acquire from us. Our Aquacleaner machines are available in a home, commercial and industrial model that have a varient Bagging Configurations that allows for the separation of water and debris. The weeds and all the solids flow into the filtration bag at rates up to 1200gpm, while the water pas back to the source. When bags are full they can be placed on a variety of different sized refuge bar that can be later taken to shore and composted or trucked offsite. We have seen re-growth as little 10% next season and as much as 50% after one application, however continued use can lead to th eradication of unwanted plants. It leaves no remains (floaters), can operate in the tightest areas rig to your waters edge. We can suction up a fish that passes through the hose without going through a motor, and is returned into the water, so we’re "fish friendly" with no noticeable fish kills. Our large-lake DASH (diver assisted suction harvesting) Boats offer the most efficient machines that we can manufacture with twin pumps that allow multiple divers to fill our filtration bags with ease. 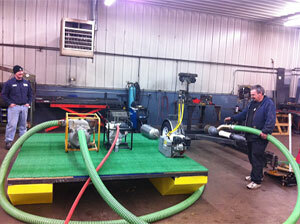 We offer you variety of choices in size, configuration and bagging options for our machines that will work best for yo ndividual needs as well as a comprehensive training program to maximize your productivity.. Suction Harvesting offers a true form of remediation of your waterfront problems and is not a band-aid like chemicals, bottom barriers or weed harvesters. The traditional method for removing soil entailed having a large construction excavator operate either from your dock or out on a barge. This process is imprecise and not very effective. Scooping large volumes of soil from a water way is intrusive, disrupting the ecosystem and doesn’t afford a close tight cleaning. Pumps are the preferred method of dredging but the norm in the industry is large, aggressive machines, which move huge amounts of water (2500gpm and up) along with sediment and are very hard to manage in a small-contained area like the backyard of your lakefront property. 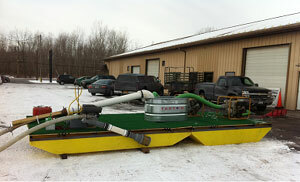 Spot/Suction Dredging operates by sucking up silt and water together (slurry) and pumping it to a desired location. The most cost effective method involves pumping the material into a field and letting the water and sediment dissipate and be absorbed into the ground. Our second option is to pump the silt and water into a dewatering bag that sits on your property. Because we pump a low volume of water, and a high concentration of solids, we are able to contain, separate and manage the spoils and return water with ease. Return water filters out with good clarity but then passes through a permeation berm where it’s filtered to an even cleaner level and allowed to return to the source. The remaining water slowly leaches out and over a short period of time, the silt contained in the bag will harden and can then be removed. 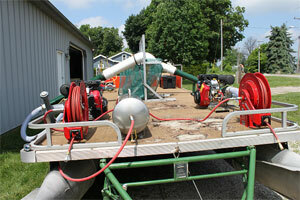 Our Pond Pumper operates by sucking up silt and water together (slurry) and pumping it to a desired location. The most cost effective method involves pumping the material into a field and letting the water and sediment dissipate and be absorbed into the ground. The traditional method for removing soil entailed having a large construction excavator operate either from your dock or out on a barge. This process is imprecise and not very effective. Scooping large volumes of soil from a water way is intrusive, disrupting the ecosystem in the water and up-land nor does it afford a close tight cleaning. Pumps are the preferred method of dredging but the norm in the industry is very large, aggressive machines, which move huge amounts of water (1500gpm and up) and lower slurry mixtures along with sediment and is very hard to manage in a small-contained area like the backyard of your lakefront property. 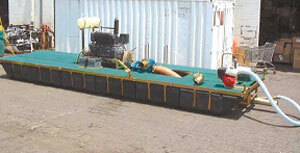 Suction Dredging operates by sucking up silt and water together (slurry) and pumping it to a desired location. The most cost effective method involves pumping the material into a field and letting the water and sediment dissipate and be absorbed into the ground. 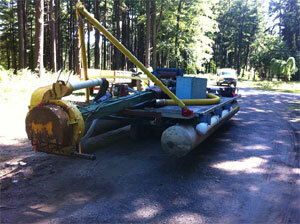 Our second option is to pump the silt and water into a dewatering bag that sits on your property. Because we pump a low volume of water, and a high concentration of solids, we are able to contain, separate and manage the spoils and return water with ease. Return water filters out with good clarity but then passes through a permeation berm where it’s filtered to an even cleaner level and allowed to return to the source. The remaining water slowly leaches out and over a short period of time, the silt contained in the bag will harden and can then be removed. The traditional method for removing soil entailed having a large construction excavator operate either from your dock or out on a barge. This process is imprecise and not very effective. Scooping large volumes of soil from a water way is intrusive, disrupting the ecosystem in the water and up-land nor does it afford a close tight cleaning. Pumps are the preferred method of dredging but the norm in the industry is very large, aggressive machines, which move huge amounts of water (2500gpm and up) and low percentage of solids thus making it harder to manage the discharge on land, in a small-contained area like the backyard of your lakefront property. Suction Dredging operates by sucking up silt and water together (slurry) and pumping it to a desired location. The most cost effective method involves pumping the material into a field or creating a silt pond and letting the water and sediment dissipate and be absorbed into the ground, or returned to the source. 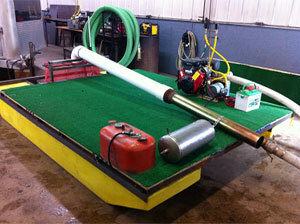 Our second option is to pump the silt and water into a dewatering bag that sits on site. Because we pump a low volume of water, and a high concentration of solids, we are able to contain, separate and manage the spoils and return water with ease. The remaining water slowly leaches out and over a short period of time, the silt contained in the bag will harden and can then be removed.